An upcoming shuttle mission will carry small columns of sand into space -- and will return with valuable lessons for earthquake engineers, farmers and physicists. July 11, 2002: Give a plastic bucket and a shovel to a child, then turn her loose on a beach full of sand. She'll happily toil the day away building the sandcastle to end all sandcastles. It's pure fun. 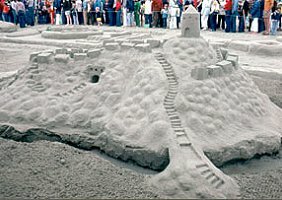 Sandcastles are built from grains--billions of tiny sharp-edged particles that rub and tumble together. The strength of a sandcastle depends on how the grains interact. What happens when they're wet? How do they respond to a jolt? It's not only beachgoers who are interested; farmers, physicists and engineers want to know, too. Above: "A sand fortress, July 1980." Photo by George Vetter, for "Cannon Beach Sand Castle Contest," an Oregon Local Legacies project. Scientists mostly understand why sand on a beach behaves as it does. Damp sand sticks together because water forms little grain-to-grain bridges. Surface tension--the same force that lets some insects walk on the surface of a pond--acts like rubberbands between the grains. Adding water to damp sand fills spaces between the grains. The bridges vanish and the sand begins to flow more easily. Sounds simple, but wet sand can still puzzle researchers. For example, when an earthquake strikes, wet soil underground sometimes "liquefies"--suddenly becoming more like quicksand than the sturdy walls of a sandcastle. 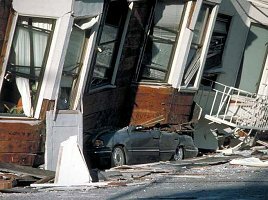 This happened during the 1989 Loma Prieta earthquake in San Francisco. Vibrations liquefied water-soaked soil in the Marina District, causing buildings to sink until their third floors were at ground level. This transition is rapid and poorly understood. During an earthquake, shockwaves compress the soil faster than water can escape, raising the pressure of the water. As the water pressure increases, the water bears more and more of the load; the sand bears less and less. Ironically, this sudden compression reduces the pressure between individual sand grains--sometimes even beneath tons of rock and dirt. "That much is understood," says Stein Sture, a professor of engineering at the University of Colorado-Boulder, "But how exactly do the grains interact as the pressures between them approach zero?" "Studying this process in ground-based laboratories is difficult because the sand's own weight creates stress on the grains," he continued. If experimentors could remove that stress (and do so for a long time), they could more easily probe soil liquefaction . That's why Sture is sending sand to space. He's the lead investigator for an experiment called Mechanics of Granular Materials-III--"MGM-III" for short--slated to fly onboard space shuttle Columbia (STS-107) later this year. The experiment is deceptively simple: A column of water-saturated sand in a latex sleeve is repeatedly squeezed between two plates. (In sandcastle terms, the consistency of the sand is more like the watery sand dripping from your fingers than the damp sand packed to make a strong tower base.) A full cycle of "squeeze and release" takes about ten minutes. This compression mimics what happens to water-filled soil during an earthquake. Above: A sand column is compressed during an earlier MGM experiment onboard shuttle flight STS-79. The speed of the movie is misleading; the complete sequence takes about an hour. Three cameras on the space shuttle will document how the column deforms. After the experiment is returned to Earth, scientists will use Computed Tomography scans (CT scans) to study the internal structure of the sand column. Then they will inject epoxy to harden the sand, preserving internal patterns for further analysis under the microscope. "This will be the first time that we've had a window into this important process," Sture says. Earlier flights of the MGM device onboard shuttles Atlantis (STS-79) and Endeavour (STS-89) revealed surprising things about dry sand. Lacking real data for low-pressure soils, scientists had assumed that trends seen at higher pressures would simply continue to lower pressures as well. But MGM-I and II showed otherwise. "We found, for example, strength properties that are nearly twice what we would have normally thought," says Sture, which means that at low pressures a layer of sand can support twice as much weight as previously thought possible. Yet if you reduce the pressure a little more so that it approaches zero, that strength evaporates completely. Puzzling! Maybe similar surprises await MGM-III. No one knows. Sture notes that "understanding this soil liquefaction process will help engineers decide when a site is safe for construction, and perhaps lead to designs for building foundations that help prevent liquefaction from occurring." The practical benefits of these experiments will reach beyond soils. Grain in a silo is also a granular material, as are bulk cereals, many fertilizers, and coal and ash. In all these cases, knowing how to coax the material into smoothly flowing or staying in place would be a good thing. Mechanics of Granular Materials -- home page for the series of experiments. Information is also available from the University of Colorado at Boulder MGM Web site. Flowing Sand in Space -- Science@NASA article: NASA scientists are sending sand into Earth orbit to learn more about how soil behaves during earthquakes. Their results will help engineers build safer structures on Earth and someday on other planets, too. Soil Mechanics Experiment Yields New Information -- Science@NASA article discussing results from the first two MGM experiments.